New artwork from artist Matthew Hatala has been added to Georgia Southern University’s permanent art collection, the Betty Foy Sanders Georgia Artists Collection, and is currently on view at the Center for Art & Theatre. The work, a wood vessel created by Hatala, was acquired and curated into the collection by Betty Foy Sanders in May. The vessel also will be included in the Georgia Artists Collection 50th Anniversary Exhibition beginning Sept. 25. Hatala, of Danielsville, Georgia, is one of the Southeast’s most prominent woodturners. 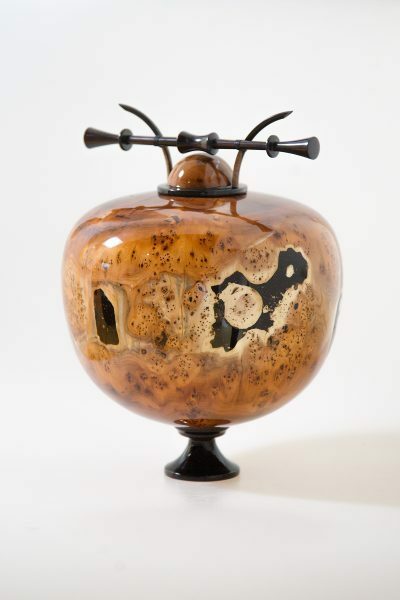 He has been creating vessels using a variety of rare and exotic wood for nearly 27 years. The piece added to the collection was made from pippy yew wood, native to the Pacific Northwest. Hatala participates in dozens of national shows and crafts festivals each year. His work can be found in notable collections such as the Detroit Institute of Art, the New York Museum of Art and Design, the Bohlen Wood Art Collection at the University of Michigan Museum of Art and many private collections, including the Montalto Bohlen Collection. Betty Foy Sanders established the Georgia Artists Collection in 1967 when she donated a painting of her own, “Coastal Sand Dunes” for permanent display. Since then, Sanders has continued to curate the collection by adding key works of art created by notable artists. Artwork is selected based on its association with Georgia–whether the artist’s origin, the indigenous material used or the regional content of the work. Now in its 50th year, the Georgia Artists Collection has grown to nearly 100 works, and is an invaluable resource to the state.